Mick Turner's Hardfacing are hardfacing specialists. Enmach Industries is located in Bundaberg Queensland and have been manufacturing tanks for many years as well as a range of other polyethylene products. Enmach also specialise in metal fabrication. Mitchell Mobile Welding provides welding services to the agricultural and industrial sectors. The company is based in Manjimup, Western Australia. White Industries has an impressive record in the provision of metal components and assemblies. We have nearly 50 years experience in industrial engineering with expertise. 06/05/09 - The strong robust construction wheeled cattle feeders is designed to be used for cattle, however they are also used for vealers and dairy cattle. 04/05/09 - The NLF 24 Cattle Feeder has the capacity to hold 4:3 m3. This feeder can also be used for feeding grains, pellets and heavier mixed feeds. 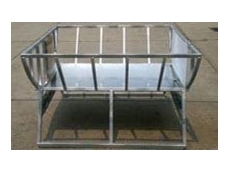 04/05/09 - Medium feeders, from Paton Industries are designed to feed lambs through to cattle up to 450 kg. 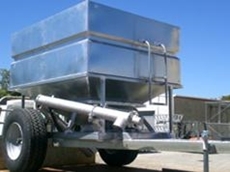 01/05/09 - 1.7 Cubic Metre Feed Out Bins are available from Paton Industries. 30/04/09 - The SHC 14 Hay Cradle has the capacity to hold one round bale of hay, straw or silage.